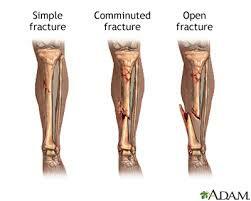 A fracture is also called broken bone. The dislocation of bone due to fall from the height or when an outside force is applied is also regarded as broken bone. The bone may be completely fractured or partially fractured in number of ways such as crosswise, lengthwise or in multiple pieces. We can usually see such accidents while playing at the playground of school or home. Other examples can be any fall, a motor vehicle accident, or a tackle during a football game. These all incidents results in a fracture or a broken bone. A broken bone can be classified into two categories. If a bone is broken into two pieces and there isn't wound outside the body, then it is said to be a normal fracture. It can be easily cured and it takes no longer time to heal. If a bone is broken into more than two pieces, it is said to be a complex fracture. Injuries can be seen on the body in this sort of fracture. It takes a longer period of time to heal. Be careful while climbing the wall, roof or tree. Cover the steps or balcony with the fence. Follow the traffic rules while travelling in the road. Listen to the coach or instructor while playing games. Exercise well before you play games. At first, console and rest the injured person. Do not let move to the broken place. If the blood is seen in the broken parts, it should be stopped. Do not shake the broken part. Take the injured person immediately to the hospital. Shock is a life-threatening condition that occurs only when the body is not getting enough blood flow. As lack of blood flow means the cells and organs do not get enough oxygen and nutrients to function properly, multiple organs can suffer damage as a result. Excessive pain, maximum blood loss, scary objects, overheats, physical and mental tiredness, the accident also results to be in shock. Likewise poisonous food, drowning, low amount of water in the body, electric shock is also other reasons. If conscious, the person may feel faint or be very weak. Shock sometimes causes a person to become anxious. The skin may appear pale or grey. Moreover, hands, legs, nose and mouth freezes. These all are the symptoms of shock. Stop the flow of blood while bleeding. Do not overdo physical exercise. Carefully use the electrical appliances. 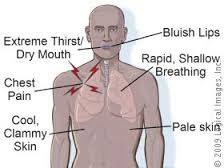 Check the person's airway, breathing, and circulation. Keep the person warm and comfortable. Loosen tight clothing. Give mouth to mouth breathing if the person does not breathe. Provide with soup and juice as the person gets conscious. Take the person to the hospital immediately. The dislocation of bone due to fall from the height or when an outside force is applied is also regarded as broken bone. We can usually see such accidents while playing at school. Shock is a life-threatening condition that occurs only when the body is not getting enough blood flow. As lack of blood flow means the cells and organs do not get enough oxygen and nutrients to function properly, multiple organs can suffer damage as a result. What are the safety measures for the broken bone? Write the first aid treatment for broken bone. Do not let move at the broken place. Write the first aid treatment for shock? How can we prevent from shock? Broken bone takes a longer period of time ________. Shock is a life-threatening condition that occurs when ______. the body is not getting enough blood flow. When a person get shock his/her skin may appear _______. When person get shock his/her hand, leg, nose and mouth________. ________ if the person does not breathe. Any Questions on 'Broken Bone and Shock '?